Jayashree Das who was the second unit director for the 2013 Sinhalese epic biographical film “Sri Siddhartha Gautama” was recently honored for directing the short film “Little Girls Sara” at the initiation of “Asia-Pacific Executives Forum” in India at Oberoi, Mumbai. She received “Master Project Manager “ certification from Colorado, USA based American Academy of Project Management (AAPM). 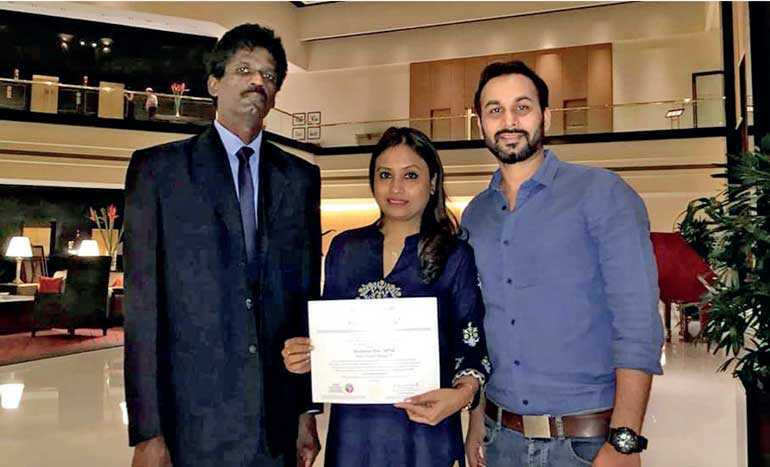 Here Jayashree is seen with Rajkumar Kanagasingam (left), AAPM Representative for Sri Lanka and Maldives and the Facilitator of Asia-Pacific Executives Forum and Abhishek Sharma Hrithikesh, writer of the short film and an assistant director at the Bollywood film industry.